We lost a dear member of the Heroes family yesterday when the great Richard Thompson passed away after his long battle with Parkinson’s disease. There will rightly be far more eloquent essays on the timeless brilliance of Richard’s Cul de Sac strip across the industry, but right now we simply mourn the loss of our friend. He entertained us with his art, and drew us into that world with his humility. When he was diagnosed with the disease, he inspired us with grace and humor even through the hardest days of struggle. Most importantly, he quietly lead us to start raising money alongside Team Cul de Sac and the Michael J. Fox foundation in their funding of Parkinson’s research. 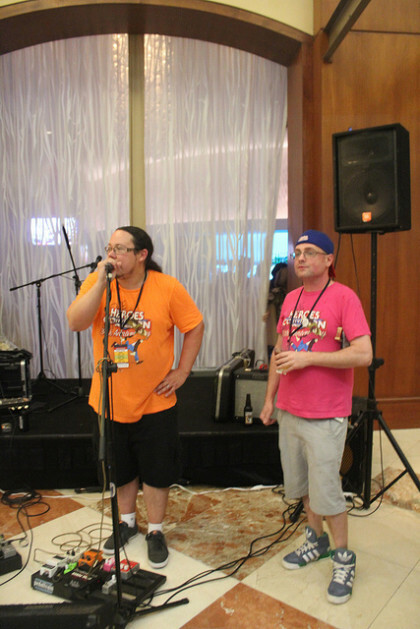 The HeroesCon Drink and Draw has been an annual event for six years now, with our fundraising contributing to the nearly $225,000 raised by Team Cul de Sac during that time. We mention that because our fight against Parkinson’s disease is still going on, and we hope any of you who love Richard, Cul de Sac, HeroesCon, our Drink and Draw event, or the fine art of comic strips, and are able, will donate to Team Cul de Sac and the Michael J. Fox Foundation in Richard’s memory today at this link: http://bit.ly/DonateTeamCulDeSac . We loved Richard the artist and the man, and offer our sincere condolences to his family, friends, fans, and everyone in comics who celebrates his life and work. All of us at Heroes will continue to fight Parkinson’s disease in his memory every year at HeroesCon. Please revisit Craig Fischer’s 2012 tribute to the greatness of Thompson here. 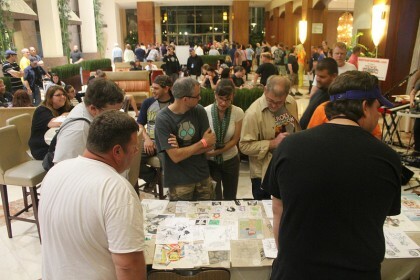 This year marks the fourth annual HeroesCon/Team Cul de Sac Drink and Draw. This event has grown each year as has the amount of money you wonderful people contribute in the fight against Parkinson’s. If you’ve never attended or it’s been awhile since you’ve made it, here are my Top Ten Reasons to Attend! 10. What’s more relaxing after a first day on the con floor than having a few drinks in the swanky Hilton lobby? The staff at the Hilton was amazing last year. They featured super hero drinks on special last year, and may have some new ones this year! 9. Not only can you kick back with some delicious drinks, you can do so while enjoying some free live music by Raleigh, NC based Jack the Radio. The guys were great addition last year and I can’t wait to hear what their acoustic sets have to offer this year. You can get a preview of the guys here. 8. Swag!! This year not only will you be able to purchase fabulous original art, but Limited Edition Drink and Draw prints with art by Alexis Ziritt and special Heroes Aren’t Hard to Find t-shirts will be available. Team Cul de Sac’s Chris Sparks also has too many great auction items to list! 7. It’s quite impressive for a group of people to put in a long day of work at the con and then extend that day into the late night in the name of a good cause. Give your HeroesCon Drink and Draw crew a hand, and maybe a drink or two to thank them for all their hard work. Seth will once again be emceeing this event and I will also be joining him on the mic this year! This is a cause that is near and dear to both of our hearts, and the Heroes family as well. 6. Not only will there be Drink and Draw art created live while you watch in the Hilton, but artists from all over have sent in pieces for you to bid on! Some of these artists don’t normally sell sketches outside of their books so this is a great opportunity to own some amazing original art you will not be able to find anywhere else. Not to drop names, but comics greats like Art Spiegelman and Stephan Pastis are sending art this year! 5. All of the proceeds of the Drink and Draw go to Team Cul de Sac which raises money for Parkinson’s research. TCDS was founded by Chris Sparks with Richard Thompson after he was diagnosed with Parkinson’s and Chris wanted to do something to help his friend. This is an amazing cause and we are so happy to be a part of the fundraising efforts. 4. You may have seen the article in the New York Post or the Press Release on this very blog, but in case you missed it, we will have on display the original Pearls Before Swine strips that Bill Watterson of Calvin and Hobbes fame did with Stephan Pastis this month. The original art will also be on display behind the Art Stage all weekend during convention hours. 3. Do you collect original art? The Drink and Draw presents the opportunity to pick up some very unique pieces at great prices. Didn’t have a chance to chat with some of your favorite artists on the con floor? 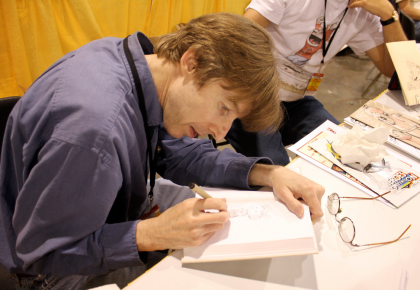 A growing number of the pros at HeroesCon are attending the Drink and Draw. If your personal favorite isn’t there, maybe you’ll find a new one or two. A sampling of original art! 2. The Drink and Draw is a much smaller venue than the con floor and it is a wonderful time to spend time with friends and make new ones. The community and support that has grown around this event has been amazing. What started as a small crowd at Fuel Pizza has expanded to the Hilton hotel bar featuring live music in just a few years time. 1. I mentioned above that all the proceeds raised go to Parkinson’s research, but the number one reason to attend the Drink and Draw is to honor Richard Thompson. Richard was actually in attendance at our very first Drink and Draw in 2011. He has not been able to join us physically since, but we know he’s here with us in spirit and happy to see such a great art community of both artists and fans honor his contribution to comics. Richard and Roger Langridge at the 2011 Drink and Draw. Want to see more of past Drink and Draws? Here are photos from 2011, 2012, and 2013. The HeroesCon Drink and Draw event takes place on Friday, June 20 at 7:30 p.m. in the Hilton Center City atrium located at 222 E 3rd St, Charlotte, NC 28202. 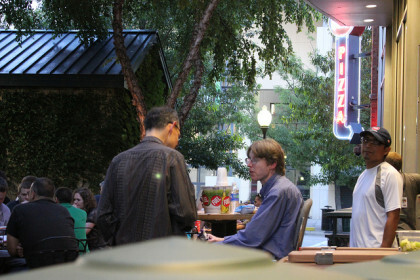 HeroesCon’s first Drink and Draw event was in 2011, modeled after the Drink and Draw Social Club founded by comic artists Dave Johnson, Dan Panosian and Jeff Johnson. That event and every one since has raised money for Team Cul de Sac, the organization founded in honor of Cul de Sac cartoonist Richard Thompson that raises money and awareness for Parkinson’s Research. 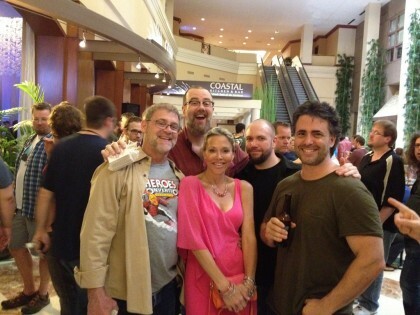 HEROESCON 2014 & BILL WATTERSON IN THE NEWS! Early Saturday morning we announced that HeroesCon will exhibit Bill Watterson and Stephan Pastis‘ three collaborative strips in Pearls Before Swine. While we knew that this would be huge news, we are thrilled that several national outlets covered the story. From the Washington Post, who broke the story, to TIME, CNN and Rolling Stone, the media seems rightly excited about Watterson’s return to the comic strip. Several comic sites, including CBR, Comics Reporter, Comics Alliance, Nerdist and The Beat also covered the story. And Stephan Pastis himself told the story of how his collaboration with Watterson came to be. Remember, HeroesCon is the only place that anyone will be able to see this art before it is auctioned off. While the media coverage is nice to see, the most important aspect of this story is that all of the money collected from the auction will be donated to our friends at Team Cul de Sac and the Michael J. Fox Foundation. We’ve been working with TCDS for four years in their efforts to raise money for Parkinson’s Research, and are honored to be a part of their continuing efforts. The Watterson and Pastis strips will be on display all weekend at HeroesCon, and we’ll have even more surprises on hand at Friday night’s Drink and Draw event. Don’t forget that you can hear all about how this art was produced and how it came to HeroesCon at our panel on Friday, June 20 at 5:30. If you haven’t ordered your tickets for HeroesCon, we’re just a few days away. Now’s the time! HEROESCON TO DISPLAY NEW ART FROM BILL WATTERSON! This year HeroesCon is proud to display the first published comic strip art from Bill Watterson in nearly twenty years! Watterson completed his inimitable Calvin and Hobbes strip in 1995, and has since remained largely private in his life and art. If you happened to read Stephan Pastis‘ popular Pearls Before Swine strip this week, you may have noticed that Pastis employed a guest artist, billed as a second grade girl named Libby, to help him with three strips. Astute readers speculated about the true identity of the guest artist, and today the Washington Post revealed it to be none other than the legendary Bill Watterson! 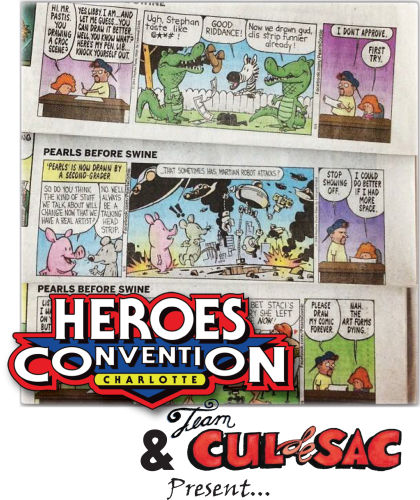 In conjunction with Chris Sparks and Team Cul de Sac, we are happy to be bringing all three Watterson and Pastis strips to Charlotte to display at HeroesCon, June 20 through 22 at the Charlotte Convention Center. The art will be displayed on the convention floor all weekend, at our Drink and Draw event on Friday night, and at Saturday night’s Art Auction. We’ll also be hosting a panel on Friday, June 20 where fans will get to hear the story of how this remarkable art was produced, how it came to be featured in Charlotte, and the part that Cul de Sac cartoonist Richard Thompson plays in all of it. The three strips produced by Watterson and Pastis will be auctioned off in the coming months, with all proceeds from the sale going to the Michael J. Fox Foundation for Parkinson’s Research. This charity works closely with our good friends at Team Cul de Sac, for whom we host our annual HeroesCon Drink and Draw charity event. More specifics regarding the auction of these pieces will be available at HeroesCon, here on our site and at Team Cul de Sac‘s page in the coming weeks. HeroesCon is the only place anyone will be able to see the rare Watterson and Pastis original art in person before they are auctioned off. This is truly a once in a lifetime opportunity for comic and art fans across the country, and we are humbled and honored to be bringing it to Charlotte. HeroesCon takes place June 20 – 22 at the Charlotte Convention Center. The Bill Watterson and Cul de Sac panel takes place Friday, June 20 at 5:30 at the convention center. The HeroesCon Drink and Draw event takes place on Friday, June 20 at 7:30 p.m. in the Hilton Center City atrium. 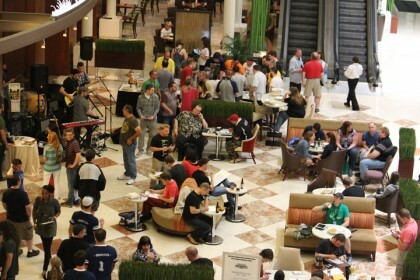 HeroesCon’s first Drink and Draw event was in 2011, modeled after the Drink and Draw Social Club founded by comic artists Dave Johnson, Dan Panosian and Jeff Johnson. 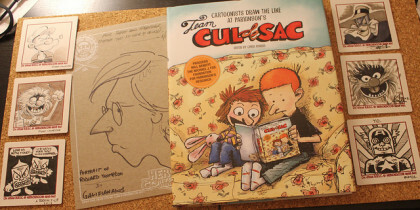 That event and every one since has raised money for Team Cul de Sac, the organization founded in honor of Cul de Sac cartoonist Richard Thompson that raises money and awareness for Parkinson’s Research. The HeroesCon Art Auction will take place on Saturday, June 21 at 8 p.m. in the Providence Ballroom at the Westin. For more information on all things HeroesCon, stayed tuned to www.heroesonline.com. If you have any questions regarding the Watterson and Pastis exhibit in Charlotte, contact Seth Peagler at seth@heroesonline.com or through the Heroes store at 704.375.7462. Additionally, you can contact Team Cul de Sac’s Chris Sparks at teamculdesac@gmail.com for further information. SETH’S PICK :: COMPLETE CUL DE SAC BOXED SET: I’m happy to remind you all that this week finally sees the release of the Complete Cul de Sac! Some of you may not know the work of artist Richard Thompson, but comic strip fans around the country know him to be a national treasure. But it’s not just fans who appreciate Thompson, it’s writers and artists who are rightly blown away by the genius-level writing and art that he infused into not only the Cul de Sac strip, but also his Richard’s Poor Almanac series. The level of humor, heart and skill readily available in Thompson’s work is truly astounding, and I can’t think of many books I’d rather have in my home library than this one. Some of you may know that for the past several years we’ve celebrated Thompson’s work at our HeroesCon Drink and Draw event. We’re thrilled to once again be working with Team Cul de Sac at this year’s event, which will take place on the Friday night of HeroesCon. I’ll be letting you know more specifics about it soon, but if you haven’t been to our Drink and Draw before, it’s a fun event where artists from hobbyists to professionals hang out at a nice bar and create art. We then auction off that art that very night, with all the money we raise going to Team Cul de Sac and the Michael J. Fox Foundation for Parkinson’s Research. It’s the best way to celebrate the greatness of the comics community and help us raise money for a worthy cause. Kick off the celebration by picking up The Complete Cul de Sac this week! This year marked my seventh year as a member of the capable HeroesCon management and organization team. Every year there are countless little moments that make me (and the rest of the staff) happy to be a part of this incredible comics community. This year, more than any other year, I was especially heartened and humbled by our 3rd Annual Drink and Draw. It was at our first Drink and Draw back in 2011 that I met Richard Thompson, the genius cartoonist behind the award winning Cul de Sac comic strip. It was Richard for whom Team Cul de Sac started, in an effort to raise money for Parkinson’s research. And it is Richard’s humor, humility and general kindness that made us want to continue to do more to battle this disease. 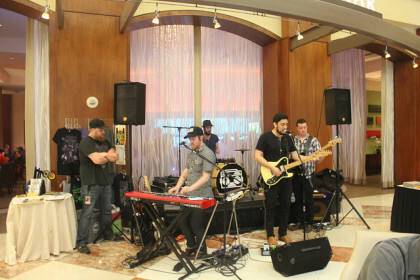 This year, thanks in part to a spacious new venue (the Hilton), an appropriately Southern soundtrack from Jack the Radio, and the creativity of professional and amateur artists alike, we raised over $7,000 for Team Cul de Sac and the Michael J. Fox foundation! The combined total from money raised in the first two years was under $3,000, so that alone should let you know the extent to which our fundraising increased this year. Planning for this year’s Drink and Draw began earlier than ever before. Team Cul de Sac founder Chris Sparks, my wife (and fellow Drink and Draw organizer) Heather and I had a few meals together in Asheville this past Spring, and talked at length about what we could do to bring even more money and awareness to Team Cul de Sac at HeroesCon’s Drink and Draw event. Chris took those brainstorming sessions and turned them into original art from Patrick McDonnell (Mutts), Jim Borgman (Zits), Mark Tatulli (Lio), Roger Langridge (Snarked), and more, all for us to auction at the Drink and Draw. In addition to these pieces, Chris brought an Art Spiegelman signed and sketched edition of Maus, and Bill Watterson signed editions of The Complete Calvin and Hobbes and Team Cul de Sac: Artists Draw the Line at Parkinson’s. With all the art produced and auctioned off at the Drink and Draw, we not only raised a sizable donation for Parkinson’s research, but sent a strong message that the philanthropic efforts at HeroesCon have never been more vibrant than they were this year. I look forward to working with Chris to bring even larger things to HeroesCon 2014’s Drink and Draw. Thanks to all the fine volunteers who continue to come back every year to help us run the event (Heather Peagler, Brian Purvis and the rest), all the artists who still draw for us after a long day on the convention floor, and everyone who donated money for the various pieces produced that night. Thanks to Chris Sparks for his perseverance, Richard Thompson for his ever-present inspiration, and Shelton Drum for giving us so much time and space at HeroesCon to continue to raise money for this worthy cause. If you’d like to continue to support Team Cul de Sac throughout the year, please visit them HERE. The battle against Parkinson’s disease needs more than just our annual event to help fight it. We hope to see you next year at Drink and Draw. We’ve already started planning, so trust me when I tell you – HeroesCon 2014 is going to be bigger and better than ever! DRINK AND DRAW AT HEROESCON FRIDAY NIGHT! If you’re attending HeroesCon next weekend, we want to remind you of what has become one of the highlights of recent year’s cons – our Drink and Draw event. Inspired by the original Drink and Draw Social Club (founded by Dave Johnson, Dan Panosian and Jeff Johnson), this is a laid back event where anyone can sit down, have a drink, and create art alongside countless comic artists and fans. The great thing about the Heroes’ Drink and Draw is that much of the professional art produced is auctioned off that night at the event itself, with all the proceeds going to charity. Amateur artists can also enter their work into art contests that night, with the possibility of winning art supplies and products from our friends at Jerry’s Artarama, Prismacolor, and Artograph. For the third year in a row we are happy to be donating all of the proceeds to Team Cul de Sac, a fantastic group that raises money and awareness for Parkinson’s research. The Heroes family became aware of this organization when our friend Richard Thompson (the brilliant cartoonist behind the critically acclaimed Cul de Sac strip) was diagnosed with the disease. Team Cul de Sac’s founder Chris Sparks has assured me that he’s bringing some incredible items to auction off at the Drink and Draw and throughout the con, including gems like an Art Spiegelman signed/sketched copy of Maus and Bill Watterson signed editions of The Complete Calvin and Hobbes and the Team Cul de Sac book. He’ll also be bringing original art from the likes of Mark Tatulli (Lio), Patrick McDonnell (Mutts), Jim Borgman (Zits) and more to auction Friday night. Bidding on the signed/sketched Maus edition will take place all day on Friday at Team Cul de Sac’s table, and resume and conclude at Drink and Draw. Similarly, you can bid on the signed Complete Calvin and Hobbes at Team Cul de Sac’s table, with bidding concluding at our annual Art Auction that night. These are truly rare items, and HeroesCon might be your only opportunity to pick them up. This year’s Drink and Draw will be at a new location, the Hilton Charlotte Center City. As with past years, the event kicks off on Friday at 7:30 and lasts until there’s no one left drawing. In addition to being one of our host hotels, the Hilton is close to the Convention Center (at 222 E. 3rd St.), and has spacious indoor and outdoor bars that will make this year’s Drink and Draw our largest to date. Another new element at this year’s event will be live music provided by Jack the Radio. They’re a Southern-Indie band from Raleigh comprised of several comic fans and artists, and we know they’ll add to the experience. 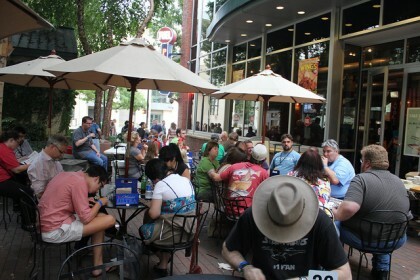 The Drink and Draw event hearkens back to HeroesCon’s long tradition of charitable involvement. If you attended the Con in past years, you might remember the numerous blood drives and work with the Firefighters Burned Children Fund. The Drink and Draw offers everyone who comes to the Con an opportunity to kick back and create some art in a fun atmosphere. Make it a point to be at the Drink and Draw, pick up one of these remarkable pieces, enjoy the comics community at large, and most importantly, raise money for a worthy cause. 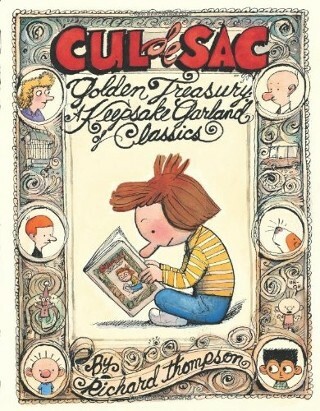 Hail Richard Thompson and Cul de Sac! August 17, 2012 By: Craig Fischer Category: Comics Industry, DISCUSS, NEWS, Now Read This! Today, cartoonist Richard Thompson announced that because of his ongoing struggle with Parkinson’s Disease, he’ll be ending his newspaper comic strip Cul de Sac on September 23rd. 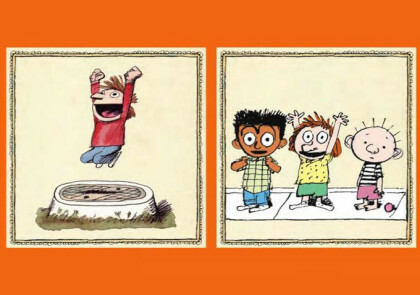 It’s no exaggeration to call Cul de Sac the finest comic strip of this generation. Thompson began the strip in the Washington Post in 2004, but its distribution remained regional until 2007, when Universal executive Lee Salem fell in love with the strip (and with Thompson’s work on another Post feature, Richard’s Poor Almanac) and offered Thompson national syndication. Cul de Sac focuses on the Otterloop family: father Peter, mother Madeleine, and especially their two kids, world-class neurotic Petey and pre-school troublemaker Alice. 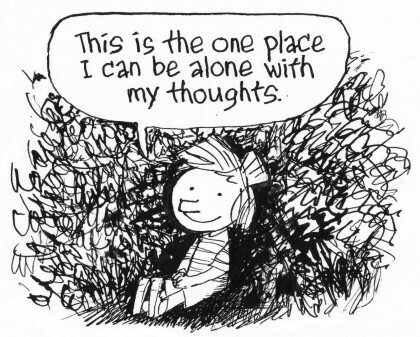 Like many other comic strips, Cul de Sac is a domestic comedy, but Thompson’s artistry elevates it into the canon of great comics, cheek-to-jowl with Charles Schulz’s Peanuts. Thompson’s skills are many: he has an uncanny ability to milk endless gags out of Petey and Alice’s diametrically opposed personalities, and he stuffs the Cul de Sac neighborhood with a joyous cast of supporting players. If you haven’t read the strip, names like Dill, Nara, Big Shirley, Beni, Viola, Miss Bliss, Ernesto, Mr. Danders, Andre and the Uh-Oh Baby mean nothing to you, but if you’re already a fan, I bet every single one of those names made you smile. Perhaps the most remarkable aspect of Cul de Sac is Thompson’s art, a sublime hybrid of Schulz, Ronald Searle and Thompson’s own whimsy, expressed through jittery pen lines and bold, expressive lettering. In today’s newspapers, where comic strip are printed at the size of a postage stamp, Thompson still delivered his daily laugh and wry observation, and earned the praise of his peers: in 2011, he won the Reuben Award for Outstanding Cartoonist of the Year, the highest honor given by the National Cartoonists Society. Richard is part of the Heroes family. He’s been to several HeroesCons, participating in panels about Cul de Sac, humor in comics, and other subjects. 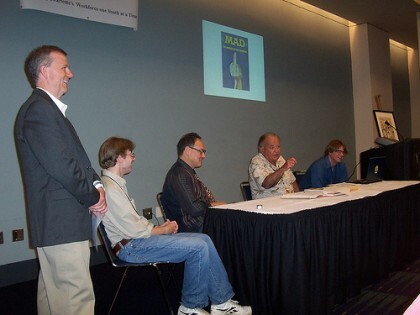 I became friends with Richard in 2008, when Ben Towle and I asked Richard (and Roger Langridge) to be on a panel where we’d collectively interview EC comics legend and Mad editor Al Feldstein. It turned out that Feldstein didn’t need our questions–without prompting from us, Al told one amazing story after another–but afterwards, Richard thanked me for the opportunity to meet Feldstein, I bought some original Cul de Sac art, and we became pals. It’s impossible to meet Richard and not become pals with him. Me, Richard, Roger Langridge, Al Feldstein and Ben Towle, Heroes 2008. Photo by Mike Rhode. Richard told his readers that he had Parkinson’s Disease in 2009, and in the years since has handled his increasing difficulties–with drawing, and with mobility in general–with heroic good humor. The last time I saw him in person, at last year’s Small Press Expo, he was frail and walking with a cane, but the first thing he said to me was a blue joke. His blog posts about his struggles with Parkinson’s are a study in grace under adversity. 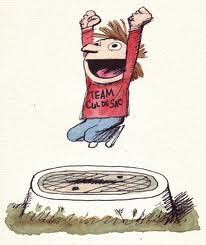 Read, for example, his farewell to Cul de Sac. There are a couple of ways you can honor Richard and his strip. With Richard’s blessing, the tirelessly generous Chris Sparks has established Team Cul de Sac, a fundraising initiative (and division of the Michael J. Fox Foundation) that encourages the comics community to donate money to support Parkinson’s research. You can donate directly to Team Cul de Sac here. If you buy Chris’ lavish Team Cul de Sac art book (featuring contributions from Sergio Aragones, Evan Dorkin, Cathy Guisewite, Bill Watterson and literally dozens of other cartoonists), and/or Favorites, a home-grown zine of comics criticism I assembled last year, money will again funnel into Team Cul de Sac. Order these goodies here. Most importantly: if you haven’t already, please read one of the Cul de Sac strip collections. A good place to start is The Cul de Sac Golden Treasury: A Keepsake Garland of Classics (2010), a fat sample of the first two years of the strip. It’s beautiful, charming–and, I think, a blast of Cartoon Nirvana, one for the Ages.